Hinduism has a very ancient and continuing tradition in the form of mantras. Mantras are the heart and soul of Hindu ritual tradition. What is a mantra? A mantra is sacred sound in the form of a syllable, word, prayer, phrase or hymn, usually in Sanskrit. Their use varies according to the school and philosophy associated with the mantra. They are primarily used as spiritual conduits, magical chants or vibrations that produced a desired result either in the mind and body or in the life of an individual. Some mantras are used to invoke gods, seek protection against enemies and evil powers or inflict harm upon others. They are used extensively in Vedic rituals and Hindu religious ceremonies to appease gods and secure their support to accumulate wealth, conceive children, earn name and fame, invite peace, or achieve victory against enemies and adversity. The tradition of using mantras is not unique to Hinduism. Several prehistoric and historic traditions, including that of Egyptians, Greeks. Mayans and Zoroastrians used magical chants to communicate with gods and obtain boons and supernatural powers. Prayers and chants were used by them to cure diseases, ward off evil influences and invoke deities and ancestral spirits. Therefore, we cannot say that the mantra tradition originated in India or it was unique to Hinduism. However, we can say that the word mantra and the concept of mantra as a sound power moved by the mind power is unique to Hinduism. Also, no other religion used mantras as extensively as Hinduism. 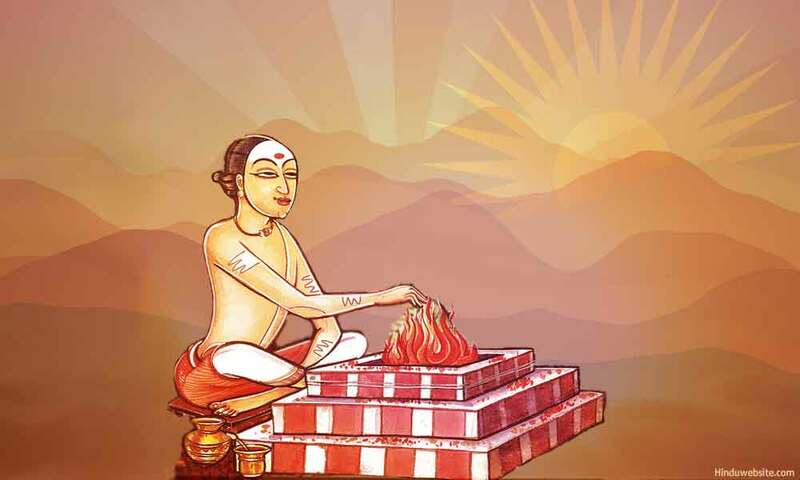 For a very long time, the Vedic education was centered around learing and remembering long hymns from the Vedas which were then used in the performance of the rituals. While many ancient religions that used magical chants became extinct, Hinduism carried forward the tradition. Mantras are also used traditionally in Jainism and Buddhism. We have reasons to believe that the use of chants in rituals was a prehistoric tradition which continues in many tribal communities even today. The word mantra is a Sanskrit word consisting of the root man- "manas or mind" and the suffix -tra meaning, tool, hence a literal translation would be "mind tool". Mantras are interpreted to be effective as sound (vibration), to the effect that great emphasis is put on correct pronunciation (resulting in an early development of a science of phonetics in India). They are intended to deliver the mind from illusion and material inclinations. Chanting is the process of repeating a mantra. Mantras have some features in common with spells in general, in that they are a translation of the human will or desire into a form of action. Indeed, Dr. Edward Conze, a scholar of Buddhism, frequently translated "mantra" as "spell". As symbols, sounds are seen to effect what they symbolise. Vocal sounds are frequently thought of as having magical powers, or even of representing the words or speech of a deity. For the authors of the Hindu scriptures of the Upanishads, the syllable Aum, itself constituting a mantra, represents Brahman, the godhead, as well as the whole of creation. Merely pronouncing this syllable is to experience the divine in a very direct way. Kukai suggests that all sounds are the voice of the Dharmakaya Buddha -- i.e. as in Hindu Upanishadic and Yogic thought, these sounds are manifestations of ultimate reality. We should not think that this is peculiar to Eastern culture, however. Words do have a mysterious power to affect us. Accepted scholarly etymology links the word with "manas" meaning "mind" and 'trâna' for protection so that a mantra is something which protects the mind -- however in practice we will see that mantra is considered to do far more than simply protect the mind. For many cultures it is the written letters that have power -- the Hebrew Kabbalah for instance, or the Anglo-Saxon Runes. Letters can have an oracular function even. But in India special conditions applied that meant that writing was very definitely inferior to the spoken word. The Brahmins were the priestly caste of the Aryan peoples. It was they that preserved the holy writings -- initially the Vedas, but later also the Upanishads. For years, they were the only ones who knew the mantras or sacred formulas that had to be chanted at every important occasion. However, with the advent of egalitarian Hindu schools of Yoga, Vedanta, Tantra and Bhakti, it is now the case that intra-family and community mantras are passed on freely as part of generally practiced Hindu religion. Such was the influence of the more orthodox attitude of the elite nature of mantra knowledge that even the Buddhists, who repudiated the whole idea of caste, and of the efficacy of the old rituals, called themselves the shravakas, that is, "the hearers". A wise person in India was one who had "heard much". Mantras then are sound symbols. What they symbolise and how they function depends on the context, and the mind of the person repeating them. Studies in sound symbolism suggest that vocal sounds have meaning whether we are aware of it or not. And indeed that there can be multiple layers of symbolism associated with each sound. So even if we do not understand them, mantras are no simply meaningless mumbo jumbo -- no vocal utterance is entirely without meaning. We can look at mantra as a range of different contexts to see what they can mean in those contexts: Om may mean something quite different to a Hindu and a Tibetan Buddhist. The analysis of Kukai, a 9th century Japanese Buddhist is revealing. See below. While Hindu tantras eventually came to see the letters as well as the sounds as representatives of the divine, it was when Buddhism travelled to China that a major shift in emphasis towards writing came about. China lacked a unifying, ecclesiastic language like Sanskrit, and achieved its cultural unity by having a written language that was flexible in pronunciation but more precise in terms of the concepts that each character represented. In fact the Indians had several scripts which were all equally serviceable for writing Sanskrit. Hence the Chinese prized written language much more highly than did the Indian Buddhist missionaries, and the writing of mantras became a spiritual practice in its own right. So that whereas Brahmins had been very strict on correct pronunciation, the Chinese, and indeed other Far-Eastern Buddhists were less concerned with this than correctly writing something down. The practice of writing mantras, and copying texts as a spiritual practice, became very refined in Japan, and the writing in the Siddham script in which the Sanskrit of many Buddhist Sutras were written is only really seen in Japan nowadays. However, written mantra-repetition in Hindu practices, with Sanskrit in any number of scripts, is well-known to many sects in India as well. Mantras were originally conceived in the great Hindu scriptures known as the Vedas. Within practically all Hindu scriptures, the writing is formed in painstakingly crafted two line "shlokas" and most mantras follow this pattern, although mantras are often found in single line or even single word combinations. AumThe most basic mantra is Aum, which in Hinduism is known as the "pranava mantra," the source of all mantras. The philosophy behind this is the Hindu idea of nama-rupa (name-form), which supposes that all things, ideas or entities in existence, within the phenomenological cosmos, have name and form of some sort. The most basic name and form is the primordial vibration of Aum, as it is the first manifested nama-rupa of Brahman, the unmanifest reality/unreality. Essentially, before existence and beyond existence is only One reality, Brahman, and the first manifestation of Brahman in existence is Aum. For this reason, Aum is considered to be the most fundamental and powerful mantra, and thus is prefixed and suffixed to all Hindu prayers. While some mantras may invoke individual Gods or principles, the most fundamental mantras, like 'Aum,' the 'Shanti Mantra,' the 'Gayatri Mantra' and others all ultimately focus on the One reality. In the Hindu tantras the universe is sound. The supreme (para) brings forth existence through the Word (Shabda). Creation consists of vibrations at various frequencies and amplitudes giving rise to the phenomena of the world. The purest vibrations are the var.na, the imperishable letters which are revealed to us, imperfectly as the audible sounds and visible forms. "The mute consonants represent the earth, the sibilants the sky, the vowels heaven. The mute consonants represent fire, the sibilants air, the vowels the sun? The mute consonants represent the eye, the sibilants the ear, the vowels the mind"
In effect each letter became a mantra and the language of the Vedas, Sanskrit, corresponds profoundly to the nature of things. Thus the Vedas come to represent reality itself. The seed syllable Om represents the underlying unity of reality, which is Brahman. Mantra Japa was a concept of the Vedic sages that incorporates mantras as one of the main forms of puja, or worship, whose ultimate end is seen as moksha/liberation. Essentially, Mantra Japa means repetition of mantra, and has become an established practice of all Hindu streams, from the various Yoga to Tantra. It involves repetition of a mantra over and over again, usually in cycles of auspicious numbers (in multiples of three), the most popular being 108. For this reason, Hindu malas (bead necklaces) developed, containing 108 beads and a head "meru" bead. The devotee performing japa using his/her fingers counts each bead as he/she repeats the chosen mantra. Having reached 108 repetitions, if he/she wishes to continue another cycle of mantras, the devotee must turn the mala around without crossing the "meru" bead and repeat. It is said that through japa the devotee attains one-pointedness, or extreme focus, on the chosen deity or principle idea of the mantra. The vibrations and sounds of the mantra are considered extremely important, and thus reverberations of the sound are supposed to awaken the prana or spiritual life force and even stimulate chakras according to many Hindu schools of thought. Any shloka from holy Hindu texts like the Vedas, Upanishads, Bhagavad Gita, Yoga Sutra, even the Mahabharata , Ramayana, Durga saptashati or Chandi are considered powerful enough to be repeated to great effect, and have therefore the status of a mantra. In Hinduism the concept of mantra as mystical sounds was carried to its logical conclusion in "seed" (Sanskrit bija) mantras that have no precise meaning on their surface but instead are thought to carry within their sounds connections to various spiritual principles and currents. For example, worship of the Mother Goddess Kali, in mantra form, is famously reduced to the powerful Bija mantras of the Shakta tradition of Hinduism: Aum Krim Krim Krim Hoom Hum: Krim Krim Krim Hum Hum Hrim Hrim Swaha Of course, the most revered of all Bija mantras is Om/Aum. The Bija mantra is part of the Hindu monistic understanding that while reality manifests itself as many/multiple, it is ultimately one. Who Is Brahman And What Is Self-realization?